Under construction, Ger Lee on right. 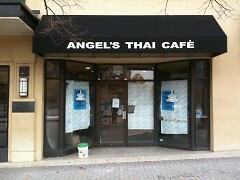 Angel’s Thai Café, a new Thai restaurant, is in development at 136 Monroe Center NW. According to Ger Lee, the café’s chef, the restaurant will feature Thai-fusion cuisine, much of which will be influenced heavily by the food of Korea. Lee believes his menu will offer a wider range of Thai food than what is otherwise available in the downtown area. Like the DeGalans at One Stop Coney Shop, Lee moved to Grand Rapids with his sister (and the restaurant’s owner), Julie, from the Detroit-area to open the eatery. The Lees had experience with several restaurants back on the east side of the state but chose to move to Grand Rapids because of the better economic climate. They were particularly attracted to the downtown area. The Lees moved to the northeast side of Grand Rapids, within five minutes of their restaurant. Angel’s Thai Café occupies the longtime former home of the beloved Four Friends Coffeehouse which closed somewhat controversially in July 2008, just over a year before the Lees started construction. Lee expects the restaurant to open by the second or third week of November.